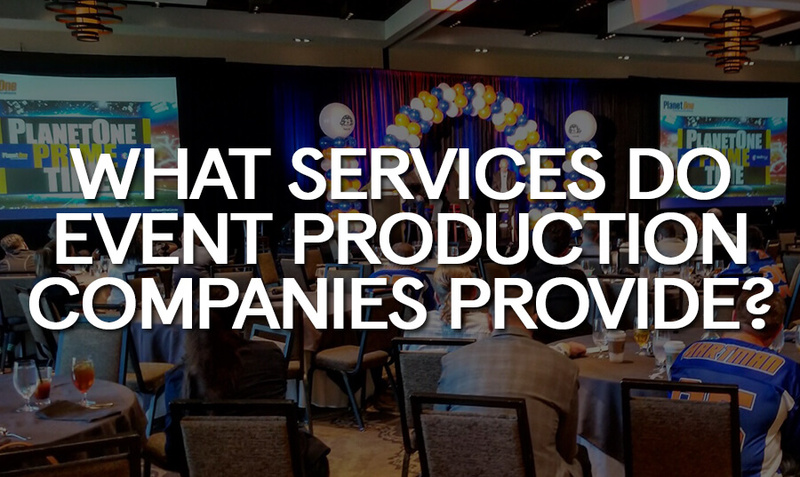 What Services Do Event Production Companies Provide? When you hire an event production company, what services are included and which services do you need to provide yourself? Though every contract is different, there are some services that every event production company is likely to offer. Here’s a general overview of the services that you may be able to choose from when you hire someone to setup and manage your event. An event production company will do the administrative and planning work for you, to ensure that the event is properly setup and executed. Some associated responsibilities include: making sure that third parties are available and ready at the requested time, arranging for insurance for the production and the staff, and scheduling any required equipment rentals and related hiring. An event involves many moving parts, with both guests and vendors to manage. Event production companies already have skilled employees — as well as robust technology — intentionally designed to control these types of situations. Further, they have the experience that is needed to identify potential issues in the event coordination, and to address them before they become disruptive. Using an event production company for event management and coordination greatly reduces the potential for mistakes, while also ensuring that everything is planned in the most efficient and cost-effective way possible. Production companies already have a tremendous number of connections and resources at hand, which can be used to better manage your own project. 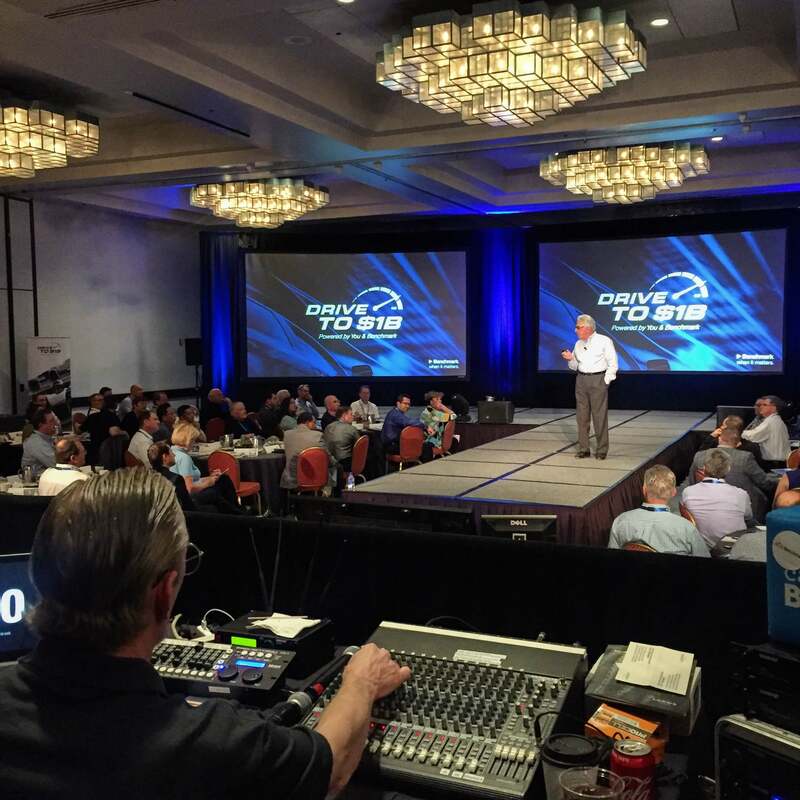 From wide-format television screens to projectors, event production companies provide all of the audio and visual services your event needs. That includes not only the technology, but also the setup and operation of the technology — something that can be complex. Many events need high quality sound systems and video systems that would be otherwise prohibitively expensive to purchase. Also known as Projection, Lighting, and Sound, audio visual services make up a great deal of any event. Whether you’ll need someone talking on a stage through a mic, or if you just want to pipe music throughout the event venue, there will need to be some careful sound testing to ensure that everything works well when live. Audio and video can both be somewhat unpredictable depending on venue, and setup may include making adjustments to the acoustics of the environment. 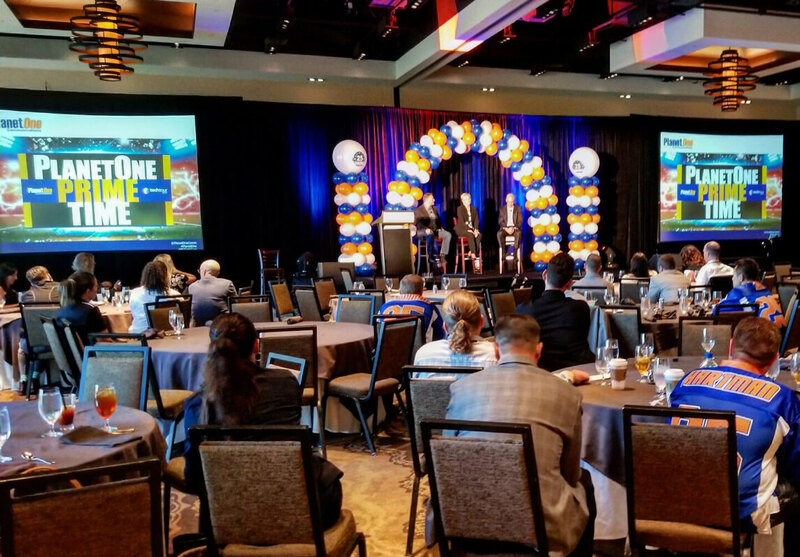 Event production companies may need to work closely with the venue in order to integrate their own audio and visual technologies or to get permission to put up certain equipment. Event production companies will also ensure that this equipment is safe: many commercial audio and video systems are tremendously heavy and potentially dangerous. Further, the equipment will be insured through the production company, and if anything unexpected does happen, they will take care of it. Are you interested in capturing your event for future archival purposes? Do you want to use it for future media and marketing materials? In addition to setting up audio and video equipment, your production company can also record your event and provide professional video production services for your company. This professional video can either be raw or carefully produced, depending on the goals of the event. However, just recording an event reliably live takes a lot of experience and skill. 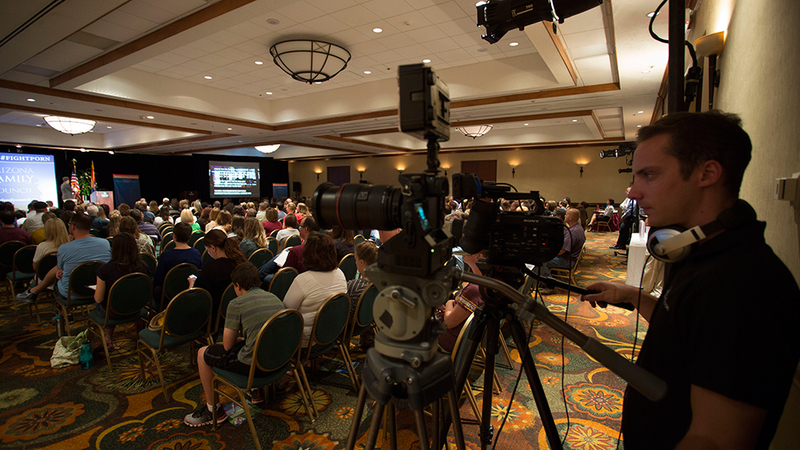 A live event isn’t always properly setup for high quality, crystal clear video and audio. Professionals are aware of the ways to get the best shots when individuals are moving, not properly speaking into a microphone, and under potentially bad lighting conditions. Having a video produced is a solid idea after any event, as video can be repurposed and reused in many ways. Many companies create commercials about their previous events, or use video from their events as part of their company training. Videos can even be sent out to prospective and existing clients, to encourage them to engage further with the business. At the earliest stages of your project, the production company can discuss your video and live needs with you, to identify the best ways to setup and capture your video. The production company will use their years of expertise to make sure that the project delivers as much value as possible, including making sure that you get as much use as you can out of the video that is recorded. This can also require additional equipment and setup time, in addition to post-processing and editing. If video does need to be processed, many production companies will either complete everything in-house or outsource it to reliable and trustworthy third-party. Processing and editing can be used to create any type of composition you need. Once video is being captured, it doesn’t have to just be saved to a file. It can also be streamed (or live broadcasted) to an audience. Live streaming is valuable for organizations looking to expand their reach, businesses trying to improve their social media presence, and events that need to go out live to employees. Streaming video involves unique challenges compared to other types of video capture. A streaming video requires a fast internet connection, and if your venue does not have a fast internet connection, the video may need to be modified so it can transmit at slower speeds. Streaming video services will work erratically if too much data is being transmitted. 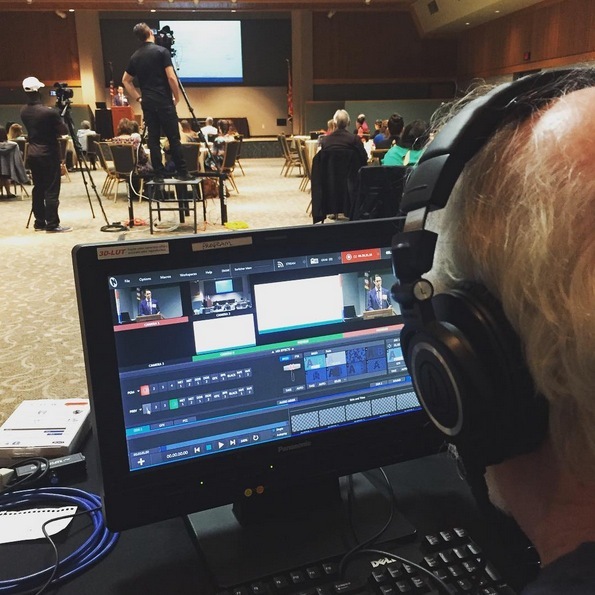 For a web streaming service, event production companies would need to know where the event is being streamed to and where you want to position the cameras for streaming. Often streams can be captured at the same time as video is captured, so you can both stream and record the video at the same time. Once an event has been captured, it can be easily distributed to virtually anyone. Companies have a wide array of choices when it comes to live streaming. Companies may stream internally within their network to a handful of employees or dozens of employees. They may also stream live on an open platform for anyone to see their event. At the early stages of a project, a production company can help in walking an organization through their options and determining the best solutions for them. When does an event truly feel like an event? After the decorations. Many events come hand-in-hand with creative and unique designs. Whether it’s a holiday event, a charity fundraiser, or a business conference, an event still needs to be staged. Professionals have virtually instant access to all the decor and props that they might need to make your event really pop. You can begin your set design with a drawing or a description of what you want most for your event. From there, the event production company will consult with the resources they have available and create a design that is feasible and within your organization’s budget. This will tie into their management and planning, as they’ll can schedule any rentals and purchasing appropriately. Before your event, you’ll be able to view your set design and staging to ensure that it’s exactly as you envisioned. Your production company can work with you on changes that you need before the event occurs. Your event has to be held somewhere. Event production companies often find venues for an organization — as well as negotiating contractors on their behalf. Venues can be difficult to find; not only does the event often have specific requirements, but they are often booked for months at a time. A production company is already aware of the available venues within the area and their amenities, and can often immediately suggest the best possible locations for an event. Further, they maintain relationships with these venues, making it easier for them to book the venues than an individual. In addition to the venue itself, the production company may need to consider issues such as ground transportation services and booking for nearby hotels. These services may be attached specifically to the venue chosen, making it important to tie down a venue early on during the planning phase of the event. As you can see, many event production companies will handle virtually everything about your production for you — so you can concentrate on the bigger picture. If there are services that aren’t listed above, they may still be available upon request… and if there is anything you want to remain in control of, you can request it. Event production companies have substantial expertise and experience, and are able to create a complete event strategy while also managing and mitigating any challenges as they occur.